Explore the MORI Building DIGITAL ART MUSEUM :teamLab Borderless and feel like your taking a trip to another world. 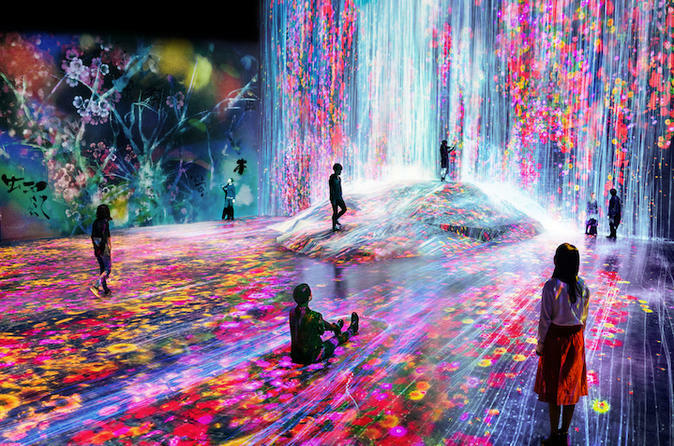 This museum is the world's first all-digital museum which incorporates Japan's digital art technology created by teamLab. Your one touch interacts with artworks, making this museum a very interactive museum. The museum's 'borderless' name, some of the exhibits are very interactive, where you can touch, move around objects, or add and delete them as well. The art is constantly rendered realtime. So no visits will be the same. With this program you don't have to worry about booking the tickets or arranging your own transportation to the museum, all of that would be coverer by us. All you need to do is inform us your hotel information and the pickup time, and the driver will pick you up with your ticket. A friendly driver will pick you up at your accommodation in Tokyo at your requested time. The MORI Building DIGITAL ART MUSEUM: teamLab Borderless admission tickets will be delivered by a driver. It takes about 30minutes to 1 hours from a hotel in Tokyo to the museum. After arriving at Yurikamome Aomi Station, you will head to the museum, located under the Giant Sky Wheel in Odaiba Pallet Town. Please show the e-tickets given by the driver at the reception to enter the museum. After exploring the museum, leave the museum and Odaiba area anytime you would like and make your way back to hotel yourself. -Last entry is 1 hour before the museum closing time. -EN TEA HOUSE opens 1 hour after the museum door opens. Last order is 30 min before closing. -Hours may vary depending on the season. Please see the official website. -People usually spend 2 to 3 hours at the museum.